Perhaps when you hear the word “influential,” you think of someone with a lot of power: CEOs, pop stars, the President perhaps. What we often don’t think of are the people who influence us in personal ways. They teach us right from wrong, they help us in times of need, they lead us through seasons of darkness, and they bring us joy in our everyday lives. Those people, I believe, are the true influencers. True influence requires making something personal before making it right. There isn’t a single truly influential person in this world who did not first identify with a greater problem before seeking to solve it. And whether our reach is small or large, what we all have in common is this: we all have, and can grow, our personal influence. Eventually that influence can gain enough traction to transform a relationship, change a life, and enrich a community. Today I challenge you to wipe away any preconceived notions you have about the word influence. Together, I hope we can challenge the idea that we are “too small” to make a difference. Instead, let’s seize the opportunity to claim that impact in real ways. Let’s lose the need to feel validated by our reach, our circle, or our number of followers. Let’s simply believe that our lives matter, that we matter, here and now. Our futures may be bright, but there is still no time like the present. 1) You don’t have a strong personality or stereotypical “leader” mentality. Not the loudest person in the room? Can’t seem to win the arguments, or even get a word in? It’s surprising that not all great leaders are extroverts or Type-A; nor do they necessarily have the “take charge” personality. Many excellent leaders lead by example, inspiring others simply by their lifestyle. Other leaders are thoughtful, introspective, and dedicated. If you’re not convinced, check out Susan Cain’s Ted Talk on the power of introverts. Solution: Find out your personality type or strengths: you can use Myers-Briggs, Strengths-Finder, or other assessment of your choice. Be intentional about using those traits to improve any and every situation you’re in. Ask yourself what you offer that no one else does: you’re unique, and so is everything you offer. 2) Your resume is not “impressive” enough. There is no doubt that a good skill set and strong education background will get you places. However, they are not the only source of influence. Influence is like the force that fights a fire. It can take the form of the person throwing water on the flames, or the person filling up the bucket at the very end of the assembly line. It doesn’t matter where you are in the effort: you still matter. Solution: If there’s a skill you feel you really need– or schooling that you need to go back for– then by all means pursue it. But if there isn’t a clear resume line that makes sense, then look at what you currently know how to do. Teach others. Volunteer your time. Help someone you know who lacks your skills or lacks free time. 3) You don’t think anyone needs your help or can learn from you. Have you ever had a mentor? Chances are, that person felt unqualified to answer all of your questions or guide you through everything. And that was probably true. However, they offered you what they could, and you can do the same. Believe me, there are people who look up to you and admire what you’ve accomplished. Solution: Offer to mentor somebody. Walk through a particular challenge with them: decision-making, college applications, job interviews, wedding engagement and planning, family transitions, etc. Support them and give good counsel when they ask for it. 4) You haven’t reached your goals yet. Some of us think that influence follows success. We tell ourselves, When I have done ____, then I can ____. The truth is, we might not ever reach our goals as planned, but that doesn’t mean we won’t make progress or succeed at something else. The lessons we learn while working towards our goals can prove invaluable. Solution: Set achievable monthly (or weekly) goals, rather than one looming long-term goal. For example, if you want to run your own small business, set goals that relate to it: learning how to use Excel, developing meaningful client relationships, or diversifying your products. Celebrate success along the way, and make note of what you learn. Share those lessons! 5) You’ve experienced rejection or failure. Failure is not the pre-requisite to success. Instead, it’s an opportunity. The platitude to learn from our mistakes is hardly revolutionary, but perhaps sharing about our mistakes with others is. So many of us can be tempted to learn from our own mistakes– only to pretend we never made them. But there’s a loss in this: your mistakes can have a positive influence over other people, if you’re willing to talk about them. Solution: If a past failure is hurting your confidence, ask what it will take to make this failure your strength. Can you encourage other people in the same boat? Can you point them to resources? If there are ways your mistake can help someone else, then it’s no longer just a mistake– it’s a tool. 6) You’re only friends with self-sufficient people. Ask yourself a hard question: how do you and your friends compare? Do you aspire to be like them? Or do they aspire to be like you? Is there interdependence or is it one-way? Here’s the problem with being friends with only people who are better off than you: you might feel inadequate. If your sole purpose is to break into a new network or circle, then you might have a hard time feeling like anyone cares what you have to offer. Solution: Choose friends from a diverse spectrum of need: not just to feel needed, but for the opportunity to meet needs on a regular basis. The best friendships often exist between people who acknowledge their need for each other. Want to meet new people? Try joining a class, volunteering at a local organization, or stopping by a community event. 7) You haven’t shared your resources in a while. It can be hard to feel influential when we don’t have the chance to give away something tangible. I believe that generosity is not only an investment in a particular cause, but also an investment in ourselves. Every time we give, we become more concerned with something outside of our own lives– and that’s a good thing. Even making a small monetary difference is the beginning to caring for a cause over a longer period of time. Solution: Give, give, give! Even if it’s just a small amount, find an organization that does work you think is compelling. Give on a regular basis, and stay up-to-date with the work that is being done. This will draw your heart close to something that matters. Here are more tips on how to be generous on a tight budget. It’s so easy for us to look around and expect someone else– with greater influence perhaps– to make a difference. But you and I need to stop telling ourselves that we aren’t good enough, or even that we aren’t there yet. The truth is, nobody is there yet, but we can all do something now. 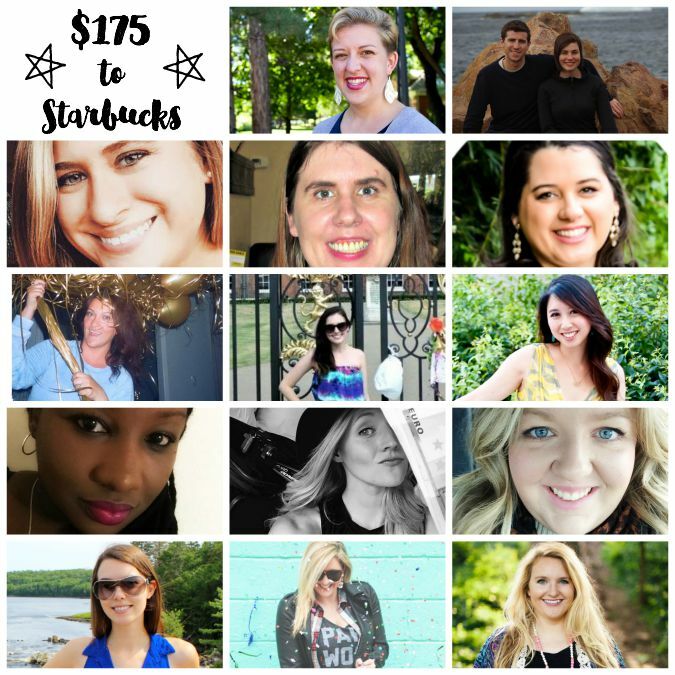 Here’s a boost: $175 to Starbucks! Buy a hot beverage for somebody who looks cold on your way to work. Offer to chat with someone over coffee who needs your advice. Bring coffee to a coworker who was up late working. Treat a friend you haven’t chatted with in a while. Give a gift card to someone else– just to brighten their day. Do you feel influential? How do you plan to be influential this week?